Since our daughter, her husband and their three little ones moved in with us, waiting for their house to be finished, people often ask how it is going. The truth is, we have settled into a lovely and comfortable routine, brought about, in part, by our willingness to live amid an obstacle course. The various baby contraptions, small furniture pieces and assorted paraphernalia scattered throughout the house have become more or less permanent fixtures. As such, they have rerouted traffic patterns and altered many of our basic movements. Our reflexes are now sharper than ever, we burn more calories each day and are closing in on long-standing fitness goals. Before their arrival, we simply walked from one room to the other with no cardio or stretch benefit whatsoever. Now the doorway from the kitchen to the dining room is occupied by a Jolly Jumper, a bulky contraption on a spring, suspended from the overhead door molding. The baby sits in the jumper seat and bounces up and down screaming with glee. To get from the kitchen to the dining room, we give the contraption a gentle hip bump, elongate our entire bodies, inhale deeply to minimize our girth, stretch until we can stretch no more, then slither through the small opening between the contraption and the door frame. Our flexibility has improved dramatically, and we are both five inches taller. The baby walker is often parked in the family room in front of the access area to the bookshelves. If you want books, a brief run and short hurdle over the walker will get you there. Reading, once a passive activity, now leaves us breathless. The portable Rock N Play, in which the baby sometimes naps, is less negotiable as it has big feet and is easy to trip over. When it appears in your path, it is best to tread softly, turn sharply, cut a wide swath around it, then resume speed. Further benefiting our cardio, we often take the stairs two at a time. A baby crying, preschoolers wailing, or the sound of water rushing from unknown origins and we are on our way! It feels good to be running track again. The Bumbo, a molded plastic seat the baby can sit in, has been a challenge as it is frequently mobile. It may be in the kitchen one minute, behind my desk chair another, or under the piano keyboard. You never know if it will be occupied by baby or by a life-size baby doll that scares the wits out of you. The Bumbo has been hard on our blood pressure, but we are adapting. Even the downstairs bathroom has become a challenge. An adult must lean in at a precarious angle over the step stool used by the girls to reach the sink and simultaneously maintain balance while washing your hands. The hand towel will be somewhere on the floor or half-way in the sink, but never in the towel ring. We disdain predictability. We’ve never been more fit. Who knows what we’ll do when they leave. Probably just sit around, grow sedentary and out of shape. And cry our eyes out. I have to provide an official copy of our marriage certificate to the Indiana BMV to get the security clearance driver’s license. After waiting seven months on the state of Missouri, where we were married, the envelope finally came—with a letter saying they have no record of us ever being married. The husband read the letter and was as stunned as I was. I laughed along with the rest of them. Then I told Free Man that he could do his own laundry. News spread quickly among our friends. One, a pastor, sent a message saying he and some fellow clergy would like to have a discussion with the husband along the lines of making an honest woman out of me. I told him I was ahead of him and had already informed Free Man that he’d be sleeping on the sofa. Then the rumbling started about getting married again. Nine of our 11 grands are little girls. The oldest is 9, followed by 8-year-old twins. Knowing the flower girl field would be crowded, they asked if they could be junior bridesmaids. “Well, I’d need a proposal first,” I said. “And a bigger ring!” one of the girls yelled. Away from the din of excitement and endless jokes, I wondered how you prove you were married when the state says you weren’t. Our wedding book was buried in the closet, covered with dust. Tucked inside were five newspaper clippings from three different states about our wedding. 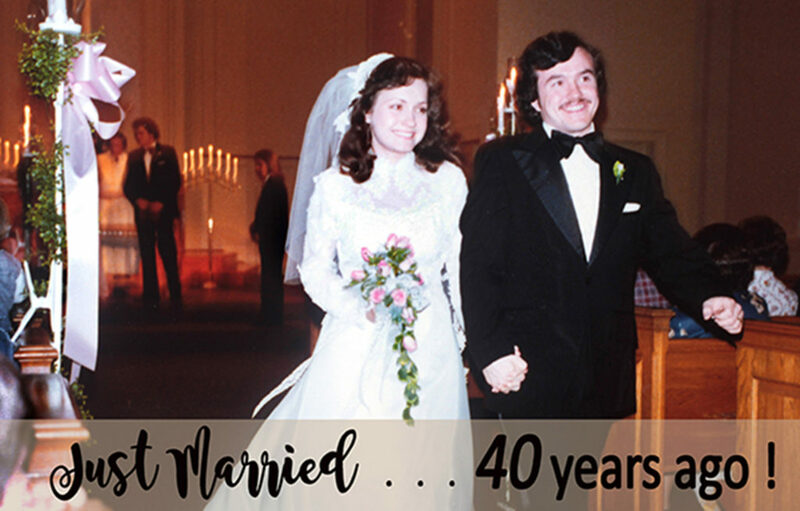 Our real ace in the hole was that we were both photojournalists when we married and nearly every wedding guest under 30 was a newspaper photographer as well. My mother said there were so many cameras clicking and flashes firing that it felt more like a breaking news event than a wedding. I called the church where we were married, knowing a huge fire had destroyed most of the building a few years after we were married. The lady who answered the phone became distraught on our behalf and quickly transferred me to someone else who keeps records. Within minutes, that woman had her hands on a church document with a number on it. She said it wasn’t like the wedding license numbers today, but maybe it was a start. Meanwhile, the man who has found a million ways to drive me nuts over 40 years with his penchant for record keeping, his fascination with numbers and refusal to throw anything away, located the receipt he signed for our marriage license at the county clerk’s office. There was a number on it that matched the number the church had. I called Missouri, gave them the number and a clerk found the license. She said she’ll send us a copy by mail. We hope it arrives before our 50th.